Abstract: In this paper, the core idea of the conversion relationship between the ellipsoidal harmonic coefficients and the spherical harmonic coefficients is derived from the orthogonality of the Legendre function and using another coordinate variable replace the former coordinate variable in the integral expression of spherical harmonic coefficients or ellipsoidal harmonic coefficients. Then the conversion relationship between the spherical harmonic coefficient and the ellipsoidal harmonic coefficient is obtained. In addition, all the derivation of this paper is based on the squared magnitude of the ellipsoid flattening. 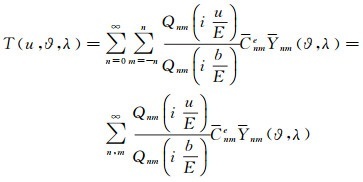 From the conversion relationship between the ellipsoidal harmonic coefficient and the spherical harmonic coefficient, we can see that:①Using Laurent series to calculate the second type of Legendre function, it is more easier to calculate the second type of Legendre function; ②With the ε2 magnitude preserved, the derived conversion relationship is simpler than the form of literature and satisfies the requirements of linearization of the physical geodetic boundary value problem; ③The difference between colatitude and reduced latitude is considered and the result is more reasonable. HEISKANEN W A, MORITZ H. Physical geodesy[M]. San Francisco: W. H. Freeman and Company, 1967. JEKELI C. The exact transformation between ellipsoidal and spherical harmonic expansions[J]. Manuscripta Geodaetica, 1988, 13: 106–113. THONG N C, GRAFAREND E W. A spheroidal harmonic model of the terrestrial gravitational field[J]. Manuscripta Geodaetica, 1989, 14(5): 285–304. DECHAMBRE D, SCHEERES D J. Transformation of spherical harmonic coefficients to ellipsoidal harmonic coefficients[J]. Astronomy & Astrophysics, 2002, 387(3): 1114–1122. GLEASON D M. Comparing ellipsoidal corrections to the transformation between the geopotential's spherical and ellipsoidal spectrums[J]. Manuscripta Geodaetica, 1988, 13(2): 114–129. MORITZ H. Advanced physical geodesy[M]. Karlsruhe: Herbert Wichmann, 1980. PARK R S, KONOPLIV A S, ASMAR S W, et al. Gravity field expansion in ellipsoidal harmonic and polyhedral internal representations applied to Vesta[J]. Icarus, 2014, 240(6): 118–132. PEARSON J. Computation of hypergeometric functions[D]. Oxford: University of Oxford, 2009. VERSHKOV A N. Determination of the spherical harmonic coefficients from the ellipsoidal harmonic coefficients of the Earth's external potential[J]. Artificial Satellites, 2002, 37(4): 157–168. 于锦海, 曾艳艳, 朱永超, 等. 超高阶次Legendre函数的跨阶数递推算法[J]. 地球物理学报, 2015, 58(3): 748–755. YU Jinhai, ZENG Yanyan, ZHU Yongchao, et al. 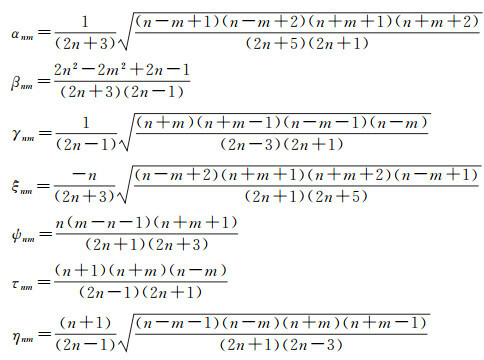 A recursion arithmetic formula for Legendre functions of ultra-high degree and order on every other degrees[J]. 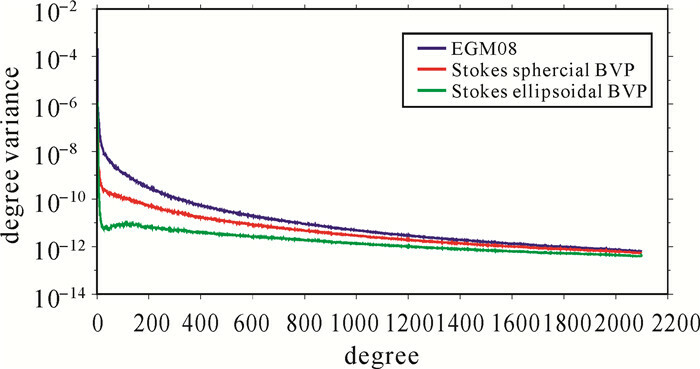 Chinese Journal of Geophysics, 2015, 58(3): 748–755. 于锦海. 地球重力场椭球谐模型的建立[J]. 解放军测绘学院学报, 1994(4): 309–317. YU Jinhai. Elliptical harmonic model about the Earth's gravity field[J]. Journal of the PLA Institute of Surveying and Mapping, 1994(4): 309–317. 张传定. 大地测量应用卫星的轨道设计——椭球谐引力场下卫星的运动[J]. 测绘学报, 2000, 29(z1): 80–85. 于锦海. O(T2)精度下椭球界面Dirichlet边值问题的积分解[J]. 地球物理学报, 2004, 47(1): 75–80.